Time Machine backup software is top-rated in Apple’s Mac OS X. This backup software is used to make backups in external storage and let you restore in case of any damage of the system or files. Moreover, the Mac user also can restore the previous healthy order if the present system gets corrupted. You, as a die heart Linux user, might be thinking that why I am discussing MacOS application in Linux blog. 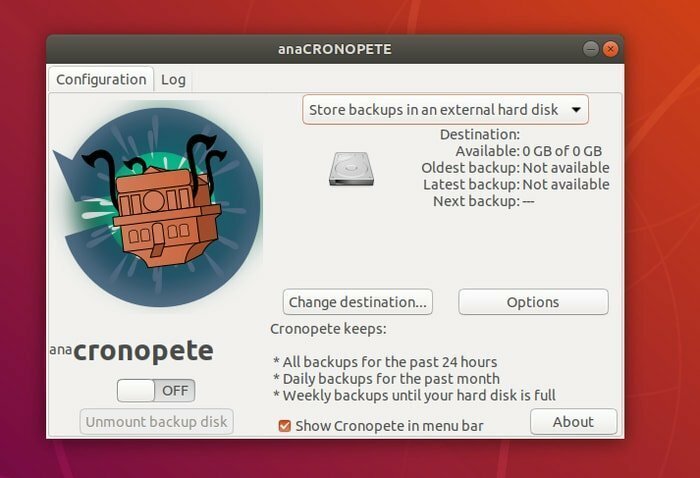 Because today I am going to share a Linux backup software which is a clone and alternative to MacOS Time Machine Backup Tool named “Cronopete.” It helps us to take periodic backup of the Linux system. It supports all the major Linux distros including Ubuntu, Arch Linux, Fedora, Debian, etc. In this quick tutorial, I show you how to install and use Time machine like backup tool Cronopete in Ubuntu to take backup and restore data. First of all Download the latest version from the official site. This file is in .deb package system. So after downloading the file, you can do two things; either you can double-click the software package which takes you to the software center with install option or install a better .deb package management tool from the software center. Now you can open the software by searching Cronopete in the app drawer. After the first launch, you see a configuration screen. It’s effortless to set up the software for the first time. Here you can see few basic options are there for changing destination external storage, option to choose the folder which you need to backup and an on-off button. Moreover, there is some vital information for the scheduled backup time. Cronopete can take backup for past 24 hrs, daily backup for past the month and weekly backup until the storage gets full. Is this tutorial helpful? If so, please spend a moment to share this article on your social media and professional network. And if you face any difficulties or want to share some suggestions, please use the comment box below. Just use http://zfsonlinux.org to I stall support for ZFS. Move your files to a secured ZFS striped or mirrored filesystem and use snapshots for backups. If you need an off line copy, use rsync to copy to another drive.